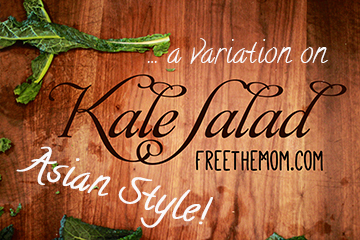 After posting my all time fave kale salad recipe last week I realized that I neglected to share with you a variation that is equally as delicious and healthy. By simply varying the dressing, you can create a completely different flavor profile that is so crazy yummy you’ll want to scream. I call this the healthy Chinese chicken salad dressing because it uses very little oil yet still tastes like the OG totally fatty restaurant version. You’ll be amazed how delicious it is when all of the ingredients are fresh! If you read my last salad recipe you know that I like a tart dressing. 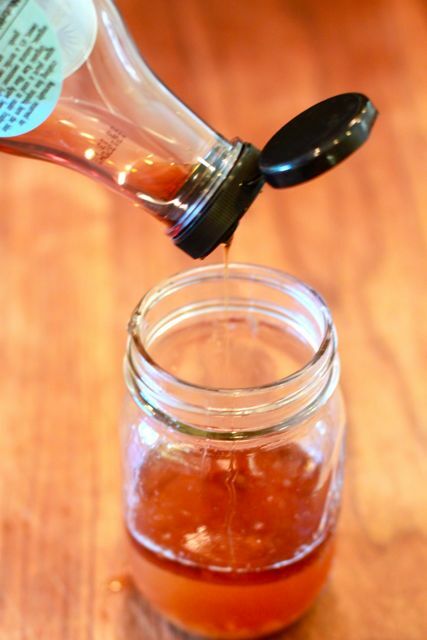 If it’s too acidic for you, add more olive and/or sesame oil. Now let’s get cookin’! Once again you can see from all of my ingredients that I am a Trader Joe’s junkie. 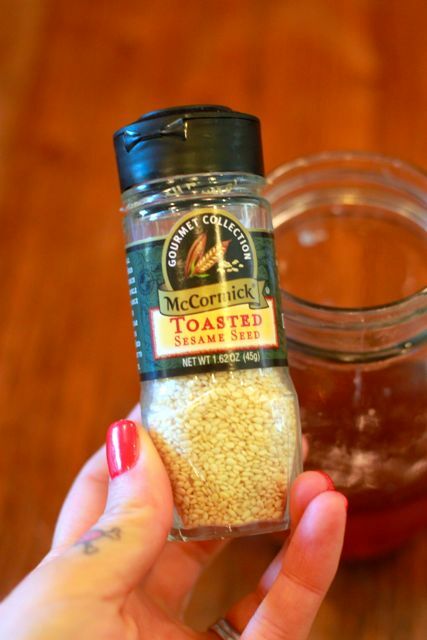 You probably have most of these items in your pantry, and if you don’t, well then you’ve been missing out! These are also the key ingredients for any great stir fry. Now for the gadgets! 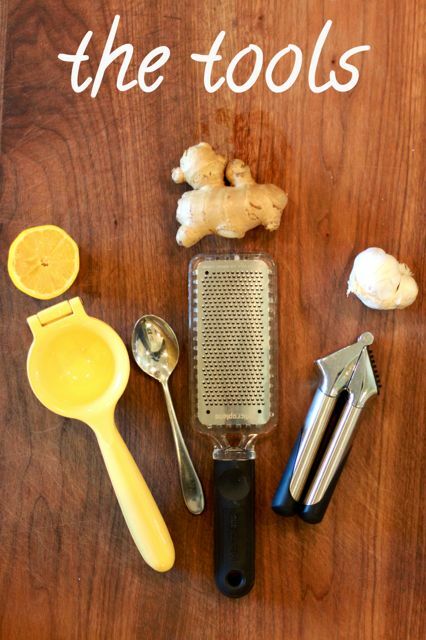 You’ll need a lemon juicer for the lemon (okay, you really don’t need a lemon juicer…), a spoon to peel the ginger, a microplane or grater to grate it, and a garlic press for…duh, the garlic. 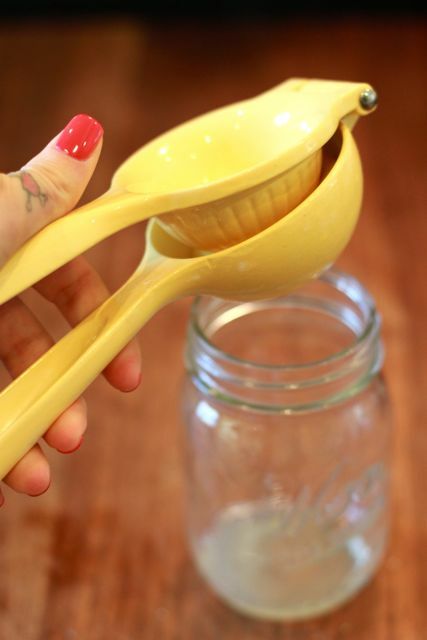 Do you see now why you need a lemon juicer? So you can take informative photos like THIS! And THIS! Right. 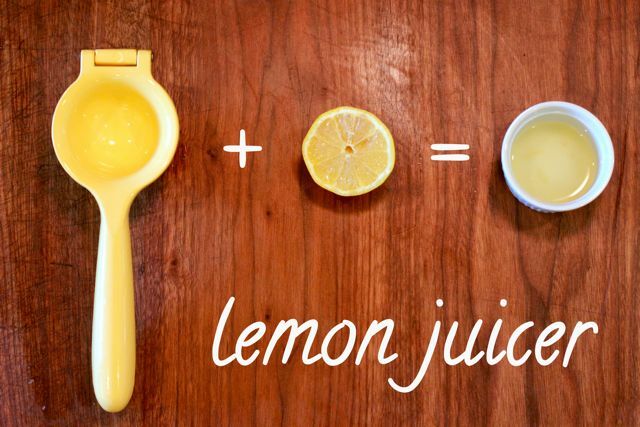 So start by juicing half a lemon. I always use a whole lemon, but I’m a sourpuss, to use caution. Next is the garlic. This press is my BFF. 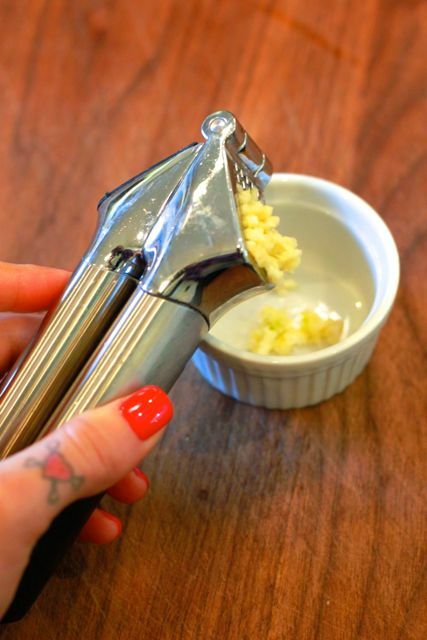 If you’re new to the garlic press, this is how it works. Open it up and pop in a peeled clove of garlic. When you close the press, the garlic is squished out of the little holes like this. 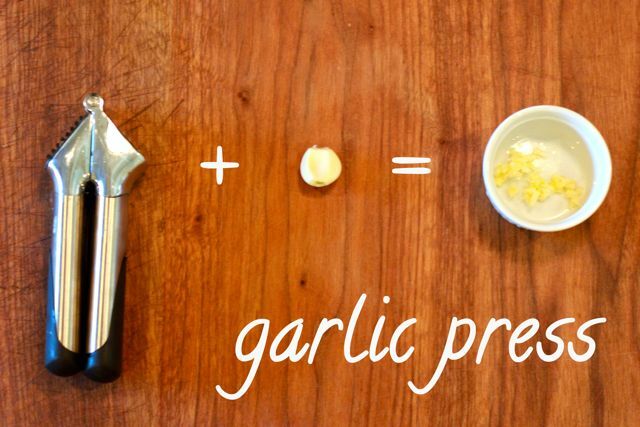 Take a knife and scrape all of the yummy garlic goodness into your dressing jar. 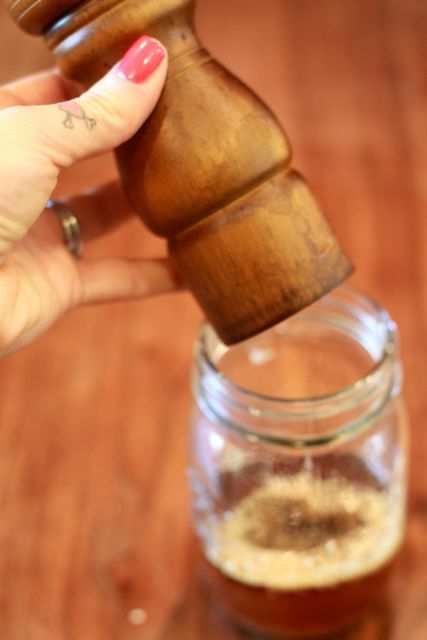 One clove should give you about a teaspoon of pressed garlic. 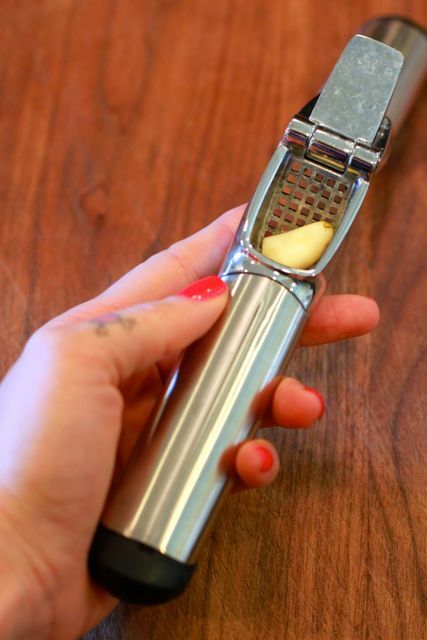 If you don’t have a garlic press you cal also run the clove through a microplane or grater. Next comes the ginger. This is a handy trick I learned a few years ago that has saved my knuckles from rogue knife and peeler blades more times that I can count. 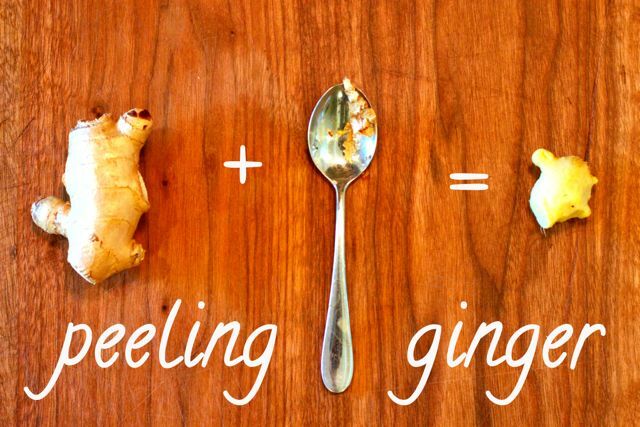 The skin of the ginger is so thin that the spoon works perfectly when a little pressure is applied. 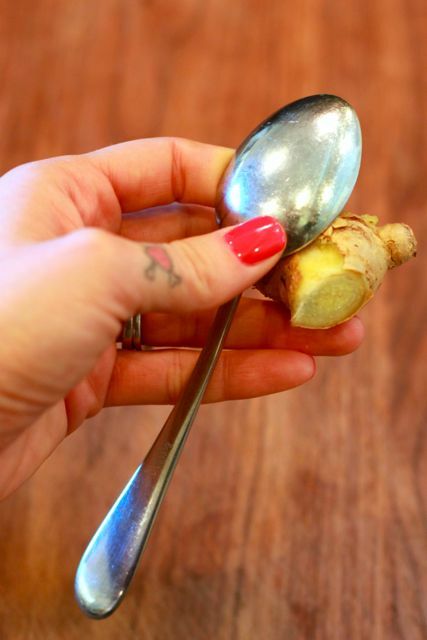 This is about the angle you’ll want when trying to get the spoon to scrape off the ginger skin. 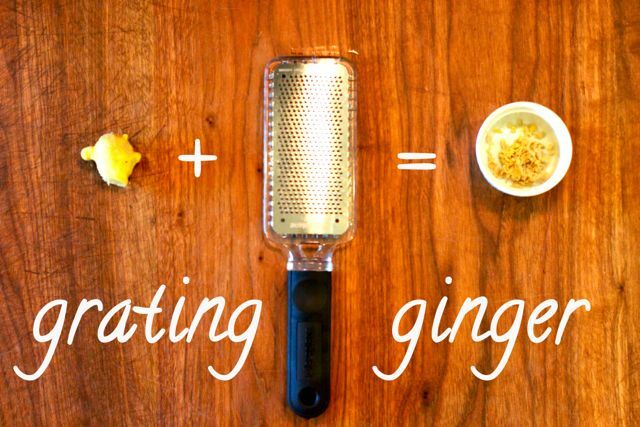 To release all of the juices and flavor of the ginger, I love to grate it on a microplane or fine grater. I started with the intention of using this microplane which has a very fine tooth and works great on nutmeg and cinnamon sticks. In practice, however, I found the the microplane to be too fine and not very productive. 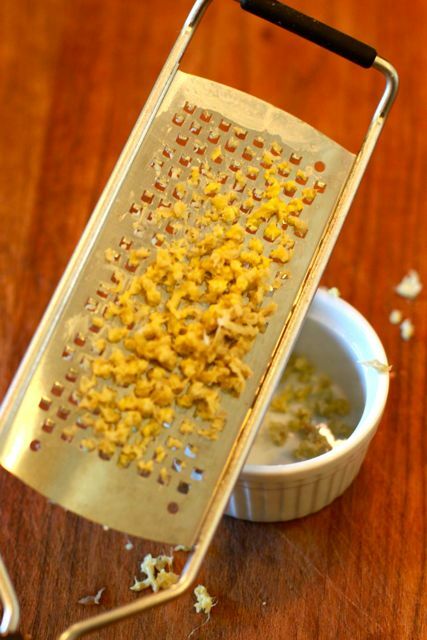 I switched it out for this small toothed grater. 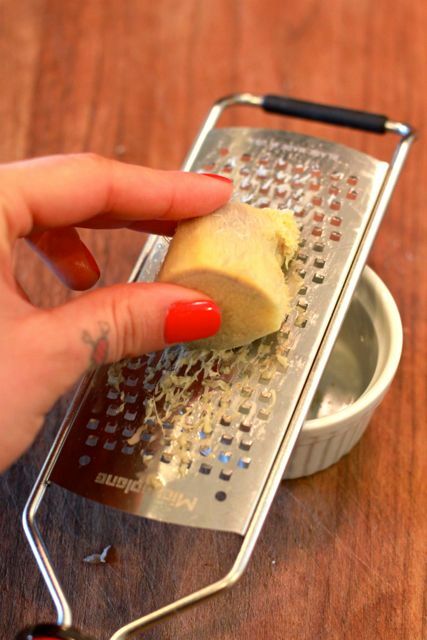 Once you grate up the ginger, you’ll need to turn the grater over and scrape off the ginger pulp that’s on the back, just like you did with the garlic in the press. 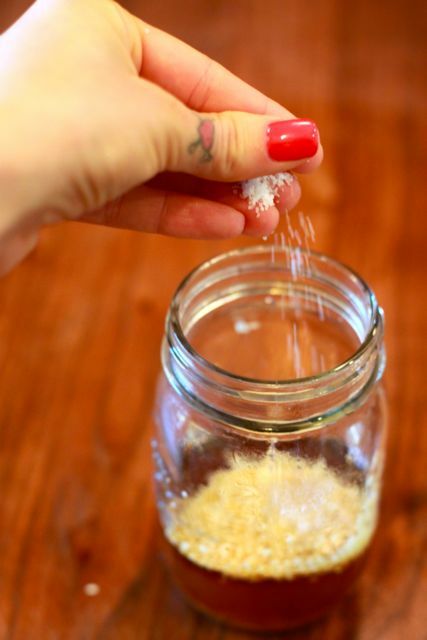 Collect about a teaspoon of the pulp and throw it in the jar with the lemon and garlic. 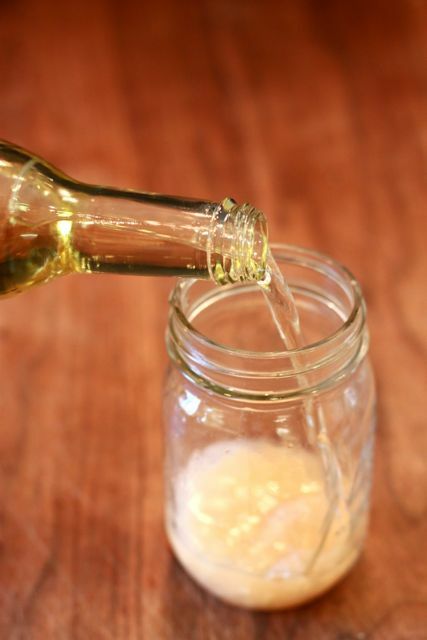 By now your kitchen should smell heavenly, and you can rejoice that the hard part is done! Do these little pour-safe caps bug you too? 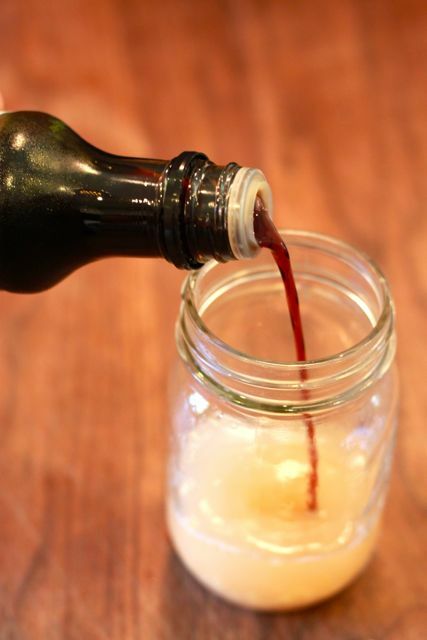 I don’t like my vinegar in a sippy cup, thank-you. Gimme a full dose. About 1/2 cup is good to start. 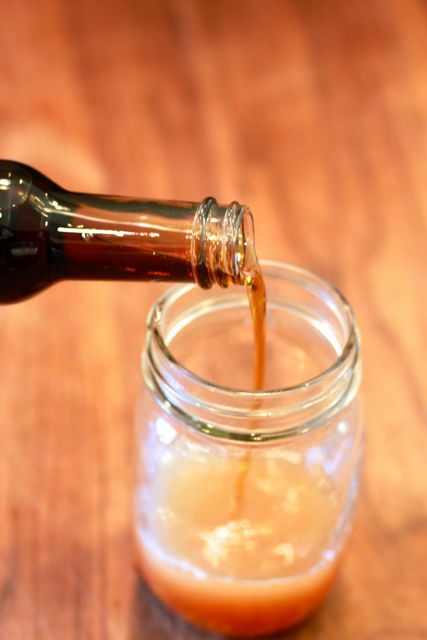 Next pour in 2 tablespoons of soy sauce and 3 tablespoons of sesame oil. 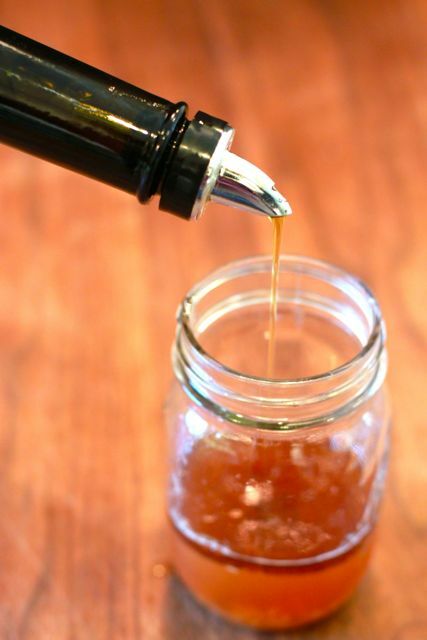 Add 2 tablespoons of extra virgin olive oil and 1 tablespoon of agave nectar. Mmmmmmm. Sesame seeds. I used to toast ’em in a pan over medium heat, but then I found these, which are pre-toasted. Brilliant! 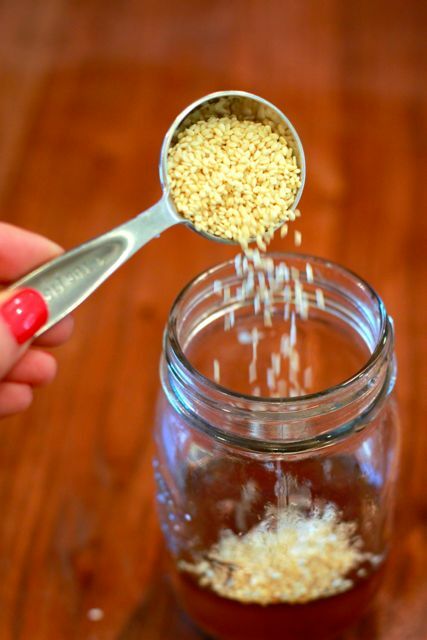 If your sesame seeds are not toasted, be sure to toss them in a skillet for a couple minutes until they begin to brown. 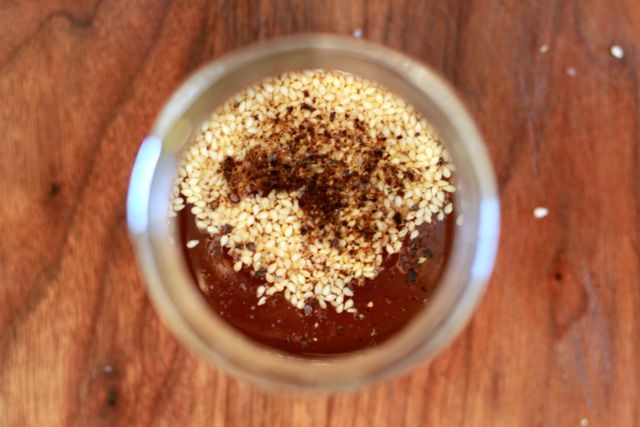 This brings out a nutty flavor and is super yummy. You’ll need about a teaspoon of these. 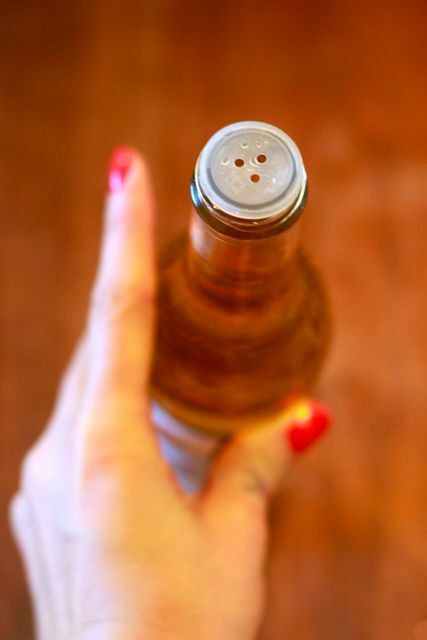 Finally, freshly ground pepper and the tiniest pinch of salt. Since the soy sauce is already heavily salted I usually omit the salt altogether and only add it at the end after tasting, if needed. Voila, look at you! Yummmmmmy! Just because I love you, I’m going to throw in a little extra info about kale. 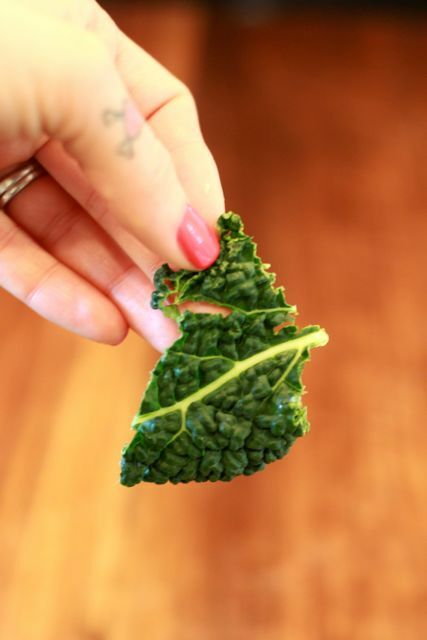 Check out my kale salad recipe for instructions on how to de-rib whole leaves. 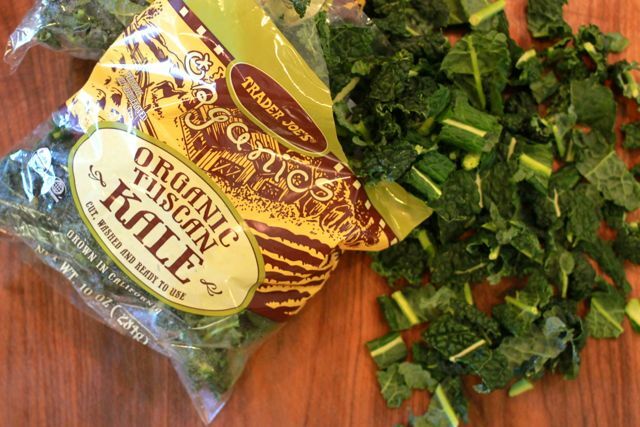 Today I thought I’d address these handy and oh-so-freaking-tedious pre-washed and chopped bags of kale. 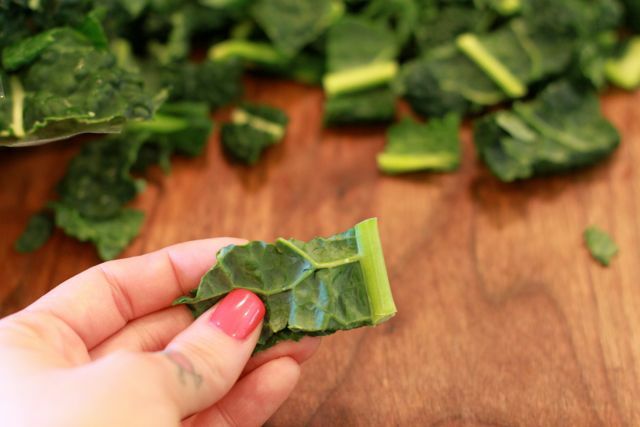 Because the kale is pre-chopped, you must finger through each and every leaf to pull the ribs from the tender part of the greens. 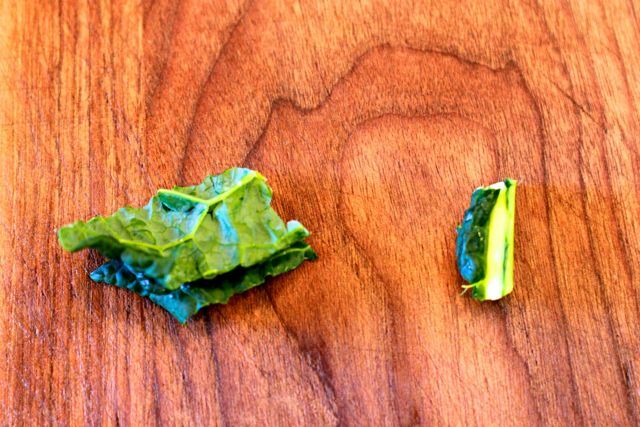 The leaf on the left has a tough inedible rib running through the middle, while the leaf on the right is just fine to throw in the bowl as-is. 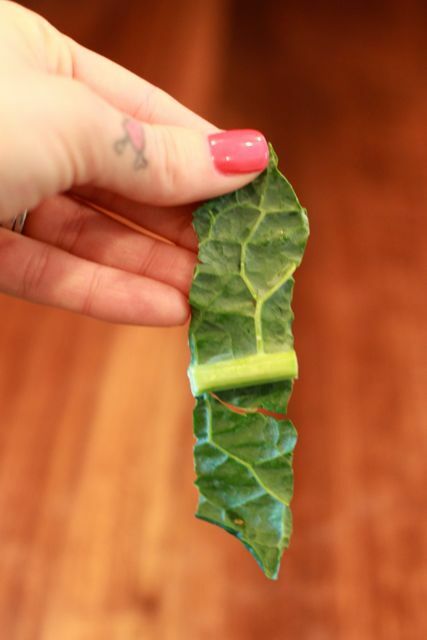 An easy way to do the job is to fold each leaf in half and just pull the rib out to separate it from the tender yummy greens. FYI, kale ribs make great chicken food. Or compost! Or rabbit food! Here you have it. Delicious leafy green on the left, tough inedible rabbit food on the right. The next step is to marinate the kale 3 hours or overnight in the dressing, massaging the leaves into the dressing first so they are all well covered. 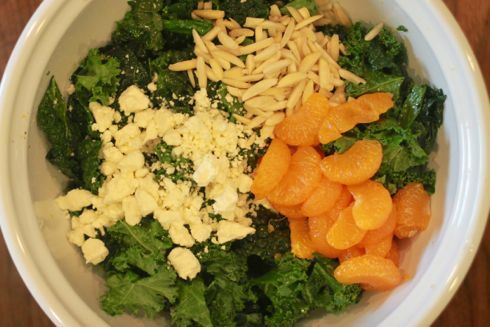 Check out the how-to details on the kale salad recipe page. After marinating and softening up for a while you can add your toppings! For a Chinese chicken type salad I recommend mandarin oranges, slivered almonds, and shredded chicken. I love to buy a whole roasted chicken and shred the meat onto the salad when it’s still warm. Mmmmmmm. Try it out this weekend and let me know what you think. Your good health makes me happy! Yay!!! This is so great! I love all the photos! Thank you!!!! Happy Friday! Kinda makes you wonder how you ever survived without a lemon squeezer!! Amazing salad recipe BTW. I need to try this ASAP! You make your recipes extremely easy to follow! And they look delicious! Thanks for the info! Anjele – this came up just as we were going to an Asian-inspired pot luck. Everyone loved it and I am addicted. Have been enjoying it all week. Thank you! Your blog is truly hilarious. Can I use this dressing for a normal salad with romaine lettuce? Would I still marinate it? 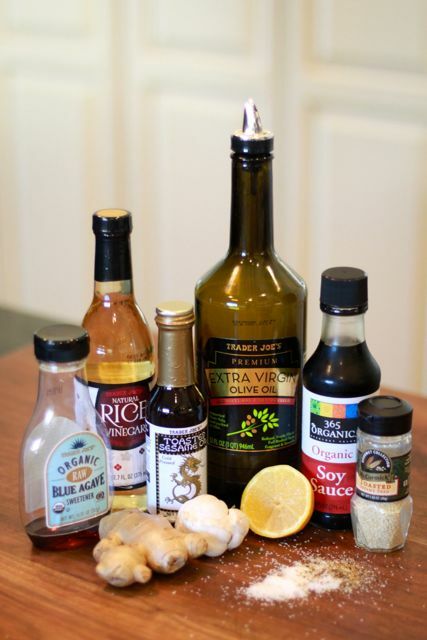 Yes, this dressing is fab on ANY salad! But you’ll only need to marinate the lettuce is if you are using kale, which is a very hardy leaf. For any other lettuce, just pour the dressing on right before serving. Enjoy!